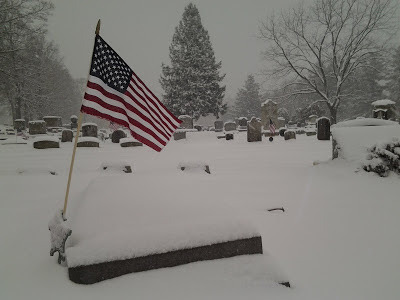 A few days ago, the snow was falling and I paused for a brief walk through an old cemetery. An interstate highway runs by it, but it was quiet and unnoticed. Some of the headstones were decorated with small American flags, and many had small bronze stars denoting the deceased as veterans of the Grand Army of the Republic, fighting on the Union side during the American Civil War. This year has seen a renewed focus on honoring our nation's military veterans, especially in providing some measure of services to help those who have been physically and emotionally wounded. Great God, in northern climes, this night is the longest of the year. Yet in every place we await the coming light, the sun of righteousness, the dawn of redemption. Come, Lord Jesus, come. We wait this night with those who lack shelter, who sleep outside not by choice, who ride the late night buses and trains and diners and waiting rooms, who are imprisoned, who are unnoticed and disregarded, who are near death, and together we await the coming of the light. In this light, we pray, all people will see that God has given enough to share, all people will see their neighbors through the eyes of love, and all people will know God's presence, with us, Emmanuel. Amen. I have been fortunate not to have much violence directly inflicted on me. But I live in a violent world. I have studied violence academically, and worked with victims/survivors of violence. I have hit others and been hit. My immediate family has been affected by a domestic violence murder. I have been closely involved with a large mass murder. I live in a city where there are weekly shootings. I watch the news, which emphasizes violent crime and war. I grew up with violent stories, from westerns to WW2 dramas to cop shows to comic books. I played games with pretend and real violence. I live in a culture which in ideology if not always in practice valorizes those in violent professions (military and police). I live on land taken from others, I enjoy the privilege of labor taken from others in prior and current generations, and my tax dollars support killing and torture. My DNA - like everyone's - comes from history's victors as well as its victims. &nbsp &nbsp &nbsp and put on forever the beauty of the glory from God. &nbsp &nbsp &nbsp for God will show your splendor everywhere under heaven. &nbsp &nbsp &nbsp "Righteous Peace, Godly Glory." &nbsp &nbsp &nbsp rejoicing that God has remembered them.